Foxhound air defence heavy interceptor. 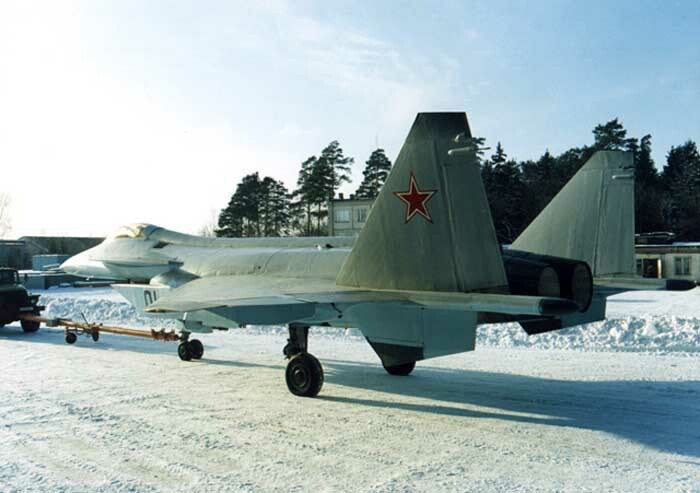 Since the mid eighties, along with the Sukhoi Su-27 Flanker, the above aircraft have formed the bulk of the Soviet Armed Forces fighter aviation. 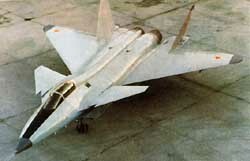 Developed in response to the adoption of the F-16 Fighting Falcon, F/A-18 Hornet, F-14 Tomcat and F-15 Eagle aircraft by the United States Air Force, they were called upon to ensure a high combat effectiveness and combat readiness level of the Soviet Air Force and Air Defence fighter fleet till the mid-nineties, with their further derivatives and upgrading programmes providing their further operability for even a longer period of time. However, life goes on, and by the mid-nineties, the USSR had planned to develop, test and put into service fifth-generation fighters which could in the early 21st century replace the fourth-generation aircraft currently operated. 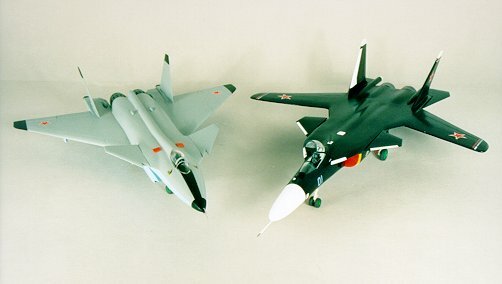 It should be noted that the fifth-generation fighter development was commenced nearly at the same time both in the United States and Soviet Union. 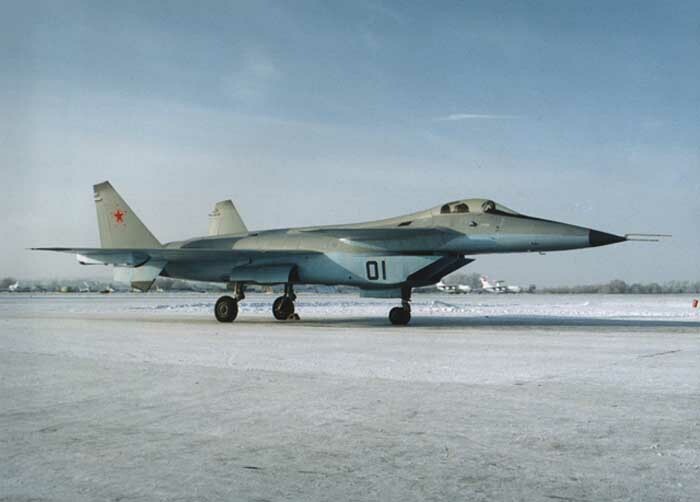 In 1981, under a governmental resolution, the USSR launched its programme of developing fighters for 1990s. The necessity for such a programme arose because of the scale of tasks assigned. 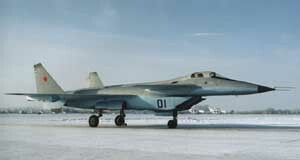 It was supposed to develop not only new-generation fighters proper but the whole complex of equipment for them as well, including prospective engines, radar and optoelectronic surveillance and sighting systems, flight/navigation and communications equipment as well as the ECM system and missiles. Like the aircraft proper, all the systems were to be of a new generation with their characteristics differing radically from those of the systems operated by the present-day aircraft. The programme was to streamline efforts by various organisations and companies responsible for the development of certain aircraft systems with the costs and labour input increasing and tight schedule pressing. The whole series of research dealing with the aircraft concept and aerodynamic configuration development, as well as with engines, weapons, avionics, materials and technologies applicable to the fifth-generation fighter, was conducted in two years. 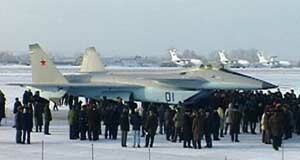 Mikoyan specialists had finished the preliminary design by 1985. 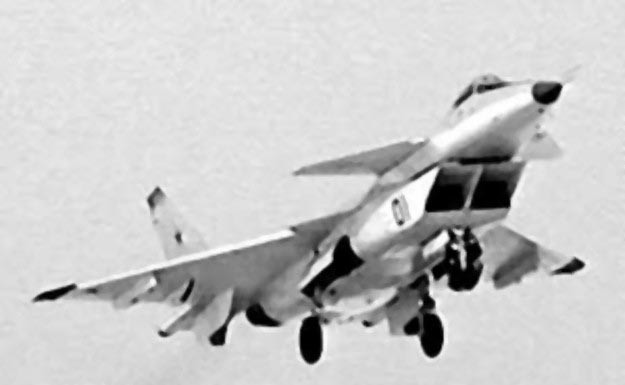 It had two parts: the first part dealt with a heavy multirole and AD fighter (MFI) while the second one concerned a light tactical fighter (LFI).  It implied a high degree of unification of the two aircraft. At the preliminary design stage, taking into account the results of the TsAGI wind-tunnel testing, research on the coatings reducing the plane's radar signature and preliminary engine and equipment characteristics, rational MFI and LFI dimensions were determined, canard-type aerodynamic configuration was chosen, major design and lay-out solutions were adopted (airframe arrangement, air intakes' form and arrangement, tail assembly scheme) and characteristics of the main fighter systems were set. Soon, the Mikoyan plant, along with other participants in the programme, presented successfully the design proposals for the MFI and LFI aircraft. Following the MFI and LFI preliminary design presentation the Mikoyan plant launched the development of the MFI sketch design code-named 1.42. In parallel, there was a decision taken to prepare design documentation for building an experimental aircraft (project 1.44) intended for assessing and trying out its aerodynamics in flight tests as well as for studying its flight, stability and controllability characteristics. 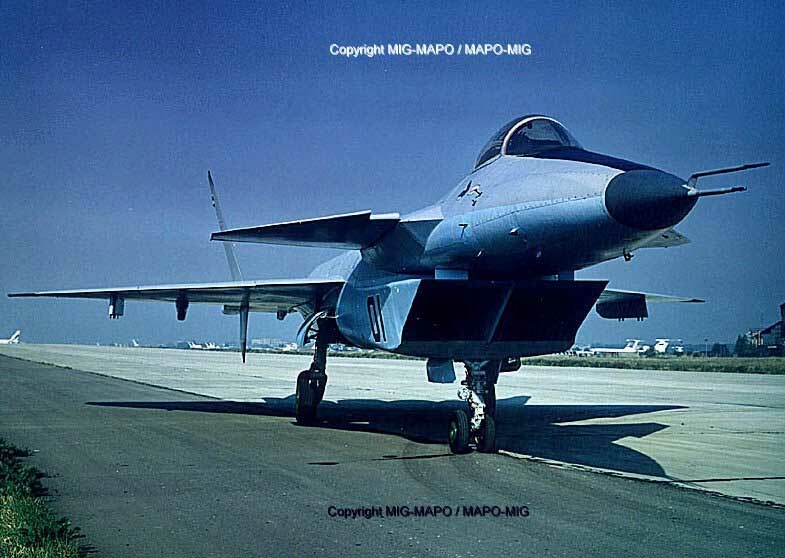 It was also supposed to be used to evaluate airframe strength, test and hone the integrated control system, powerplant and equipment and, later on, the whole system as well. A lot of work was done by the Lyulka-Saturn association headed by Designer General Victor Chepkin. It managed to build more than twenty fifth-generation AL-41F TVC engines tested both at the plant and TsIAM Institute test-benches as well as at the LII institute flying laboratories, i.e. 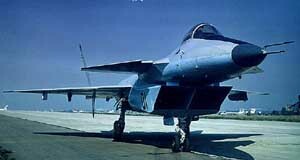 the subsonic on based on the Tu-16 bomber and the supersonic one derived from the MiG-25PD interceptor. In 1991, the fighter's sketch design was adopted. Unfortunately, the MFI programme funding has been considerably cut since 1992. 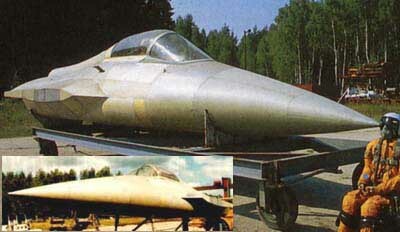 Nonetheless, the MiG ANPK managed to build the mock-up and airframe components for static tests. In cooperation with series production plants, it made a technological advance for making prototypes. 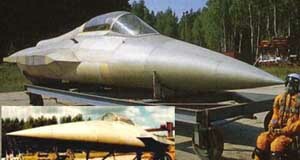 In early 1994, Mikoyan completed the construction of the first MFI flying prototype - the 1.44. 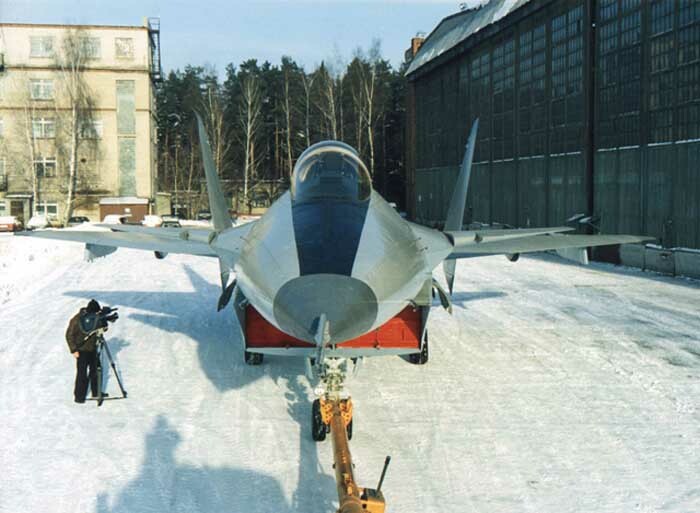 In summer 1994, it was delivered to the Zhukovsky-based LII airfield where the ground testing of the 1.44 prototype systems was continued and preparation for flight testing was launched. In December 1994, the aircraft controlled by test pilot Roman Taskayev made its first high-speed taxiing on the LII runway. 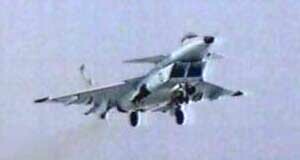 However, due to dramatic cuts in the MFI funding ensued by the economic situation in Russia, the fighter did not reach the flight test stage. In 1995, the funding of the programme dried up. Late in 1998, the management of several companies concerned succeeded in persuading the decision-makers to give a green light to unveil the aircraft to the public. Such a demonstration was aimed at drawing attention to the programme, which could prompt the government to allocate additional funding for the testing to begin. 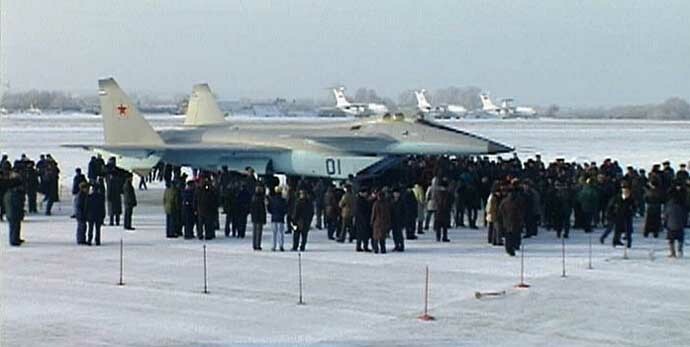 Besides, unveiling the new sophisticated warplane was expected to draw potential foreign partners interested in joint development of prospective fighters in cooperation with the MiG company. 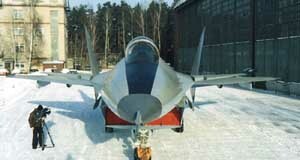 The MFI fighter was demonstrated on 12 January, 1999 when the prospective fighter, alongside other MiG's aircraft, was officially presented to the Russian military leaders, military attaches of several countries and media. 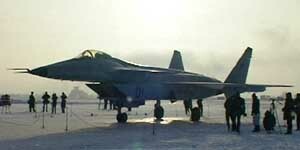 The fighter taxied down the LII Flight Test Institute runway to the demonstration site powered by its two AL-41F. 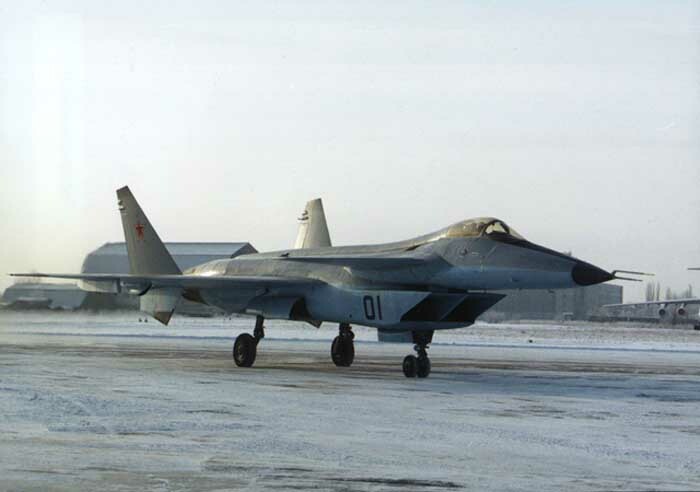 The MFI's development, productionising and fielding with the Russian Air Force could both further bolster the national defence capabilities and increase exports, thus creating favourable environment for international cooperation in the field of aircraft building in the XXI century. 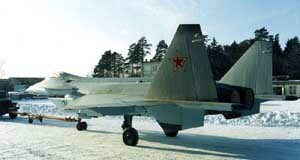 The first flight the 1.44 was held February, 29, 2000 on aerodrome LII of a name of M.M.Gromov in a Joukovski. 18 minute flight passed 500-600 km/hour for speed. 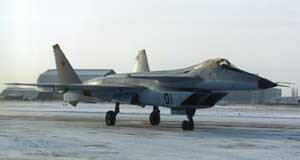 The airplane was piloted by the pilot - verifier the Hero of Russia V.Gorbunov. The second flight proceeded 22 minutes. The description of a design, Specification and scheme.